Bees flying around the chimney are commonly honeybees though sometimes they are hornets. To start, knowing the type of bee can help with preventing a bee problem and determining what to do. If your not sure no problem, this info can help you learn more. The topics below especially specific to honeybees, through hornets and wasps are also covered. The bee id chart can also help with identification. Best observation time is between 10am to 5pm daylight hrs. Less effective times to inspect are with rain, extreme heart or wind. Identification: These are commonly honeybees, or hornets. Bees getting in the house are easy to identify, otherwise binoculars may help. If you can not get close, and you do not have binoculars handy consider this. Honeybees may have a lot of bee activity. Honeybees have thousands of bees within a beehive. Hornets keep smaller nests then honeybees. For hornets or wasps, skip down to the section on hornets in chimney top. Before nesting in a chimney a honeybees will send out scout parties, handfuls of bees in search of a new home. Scout bees that are inspecting a chimney often wander too far down the flue and gets lost inside the house. You may find bees near a light, or on the window in a room near the chiminy. Bees that get in the house, fly to the window looking for a way out, they are non aggressive though stings can happen by accident. If you have noticed bee activity longer than a few days, bees have typically already moved in. Skip down to the section on Established beehive in chimney. Otherwise, with a bee swarm has not yet moved in, lighting a fire can temporarily keep the bees away, though it is commonly not be the best method and better methods exist. As well, lighting fire can cause honey to run down chimney if a hive does exist, creating long-term problems. Additionally with a new swarm that has moved in, lighting a fire can cause the bees nest to fall down the chimney and can end up in the house. You can tell weather or not the bees have moved into the chimney, visit this section on how to prevent a bee problem. It discusses how to tell if the bees have not moved in, and if so, what you can do to prevent the bees from moving the hive into the structure. If you think the bees are new, having them removed as soon as possible is a good choice; a new bee swarm has thousands of bees, they make honey & honeycomb fast. Chimneys with open flues can be fairly easy to have bees removed. Double-wide chimney tops and chimneys with caps can be a more costly ordeal, additionally bee proofing a chimney can prove a challenge to keep away future bee problems. Perhaps most important is afterwards removing the hive scent of an established beehive; melted honey from lighting a fire can make that more challenging. Honeybees are year round critters, they dont leave the nest at winter time. If you think an established beehive is in the chimney and the chimney has a cap or it is a double wide chimney top, it would be wise to talk to a bee remover. A beehive can have a whole lot of honey and thousands of bees. Most bee removers have experience with removing a beehives from capped or enclosed chimneys, though the quality of work may vary. A beehive in a chimney can with some effort be removed alive, though that depends on the bee removers comfort with the chimney height and the working space available. You are welcome to call the bee removal hotline to speak with a local bee remover near you. Do it yourselfmethods of structural bee removal from a chimney can be very difficult to accomplish. When a honeybee hive is living near the chimney top, lighting a fire can cause long term problems, it doesnt solve the problem, instead bees may congregate atop the chimney for as long as needed. A fire nearly always makes the problem worse with melting honey on the sides of the chimney, causing a more permanent honey saturation to encourage returning bees for years to come. Bees along the side of chimney, were chimney meets wall, means a beehive is between the interior wall and the back of the chimney, unless the bees are scout bees and have not yet moved in. In the case of scout bees, you can prevent a bee problem. Bees behind the chimney wall are commonly honeybees though sometimes they are hornets; the bee id chart can help determine what type of bee your seeing. Removing a honeybee hive helps to avoid recurring bee problems from melted honey. Bees along the side of chimney getting in between the wall (not the roof line area) are less critical then other areas in regards to removing honeycomb. It is a difficult location for future critters to move into, and fairly easy to bee proof afterwards to keep bees from returning. A beehive left in a structure causes honey to melt structurally, encouraging recurring bee problems. When bees are between wall and chimney, two common methods to get rid of them are extermination, or live removal. With extermination you would afterwards typically open drywall from the inside of the structure opposite the chimney, then remove the exhausted hive, clean, suppress the smell, bee proof, and repair the drywall followed with warrantee against retuning bees. Nests may have 10 to 80 lbs of honeycomb. 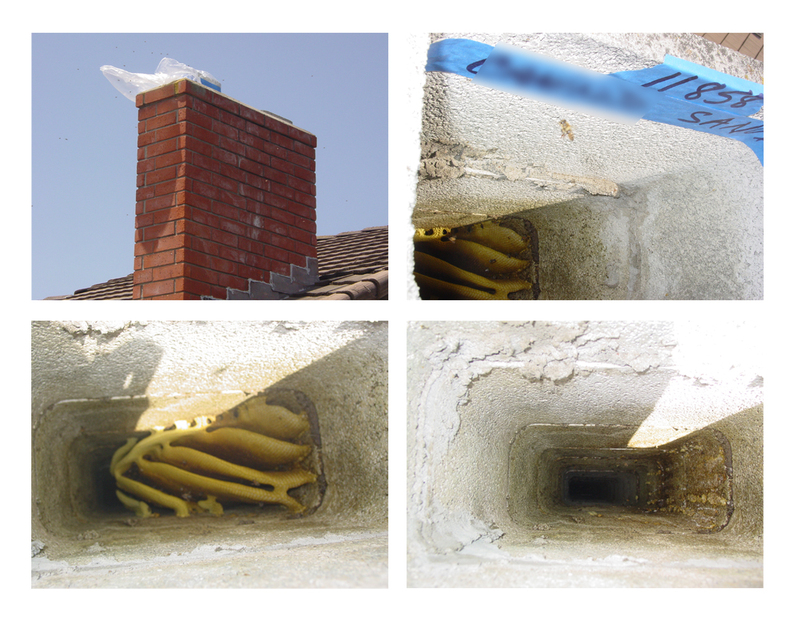 Live removal of the bees between the wall and chimney provides two options. Either removal by trap out method, or removal from the inside of the structure. Bee removal from inside of the structure commonly requires sectioning off that part of the wall with plastic, optionally cooling the hive, and then removing the bees. Preferred time to accomplish that is earlier morning or late evening, unless it is wintertime or a rainy day, then anytime of day is great. Bees are typically dormant during very cool weather, making them easier to interact with. Bee activity were roof line meets chimney typically means a hive is living in the structural attic void or eave. They may bee honeybees. Upper & middle regions of the U.S. & Canada additionally experience hornets. It is much less common that they are yellowjackets. Here is what you can do. With hornets, removing the hive may be optional to solve the problem. Bee proofing the structure can help to discourage recurring nests each year. Nests left in the structure may minimally attract insects, rodents, and small animals. With bees, removing the hive and honeycomb is typically important to resolving the problem. Honeycomb left in the structure can cause recurring bee problems as well attract insects, rodents, and small animals. Bees that are entering near the tin flashing were the roof and chimney meet, can nearly never be accessed easily from the attic crawl space. With regards to removing a beehive, it is wise to have the same person that removes the bees, to also clean, bee proof, repair, and warrantee against bees returning. As mentioned, structural removal of a beehive from a chimney by do it yourself methods can be difficult to accomplish successfully. The two most common types of double wide chimneys are stucco chimneys and brick chimneys. When bees are buzzing on top of a stucco chimney, the bees are usually not in the actual flue (were smoke travels) but within deadspace beside the flue. 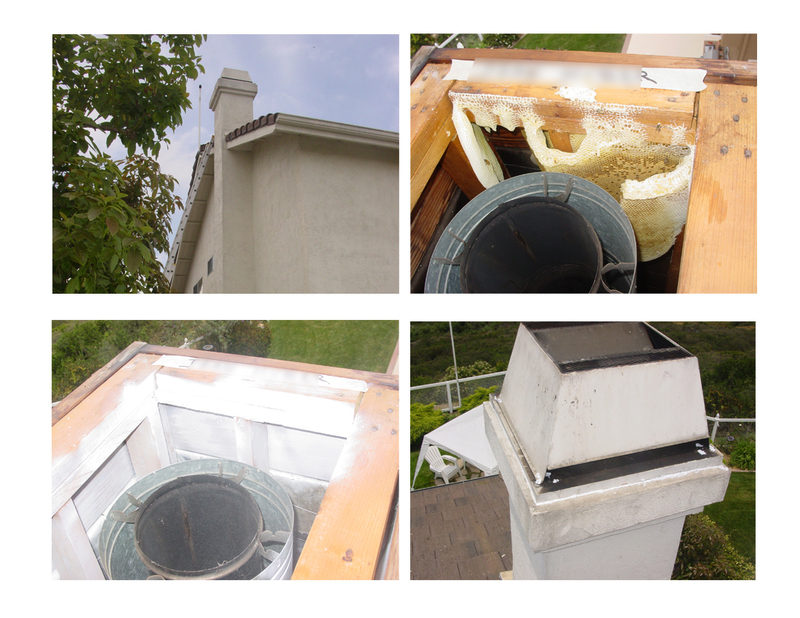 The common solution is to open the chimney cap to remove the beehive, then clean, treat, and repair the chimney top. See the topic below on removing bees from a capped chimney covering do's & donts. Brick chimneys can be most challenging. It is most difficult when bees have moved into the chimney dead space, and not simply inside of the open flu were the smoke travels. Although the bees may enter at the top of the flu; they often continue though a crack (common with older chimneys) into the hollow area or dead space to the nest. No easy method exists to remove bees from the dead space of a brick chimney. Below are four options. ▪ Exterminate and then bee proof the locations were the bees are getting into the dead-space. - Note this causes honey to run down along the inside of the chimney structure. ▪ Live removal: open chimney to remove bees. This is a good choice as both bees and honeycomb get removed, the area gets treated to suppress the hive sent, and should include a warrantee against returning bees. ▪ Extract bees alive through trap out. Requires finding a bee remover to trap out the bees. This is less recommended then opening the chimney structure because it is commonly a difficult location to perform a trapout, and because during the process honey melts down the chimney, though after words most of it gets removed. See Trap out. ▪ Option four would be to leave the bees as they are, if that is an option though it is typically discouraged. Chimneys with structural caps are challenging. New homes with chimneys commonly have a chimneycap. All chimeny caps have a spark arrester on top. These are not a basic spark arrester that you simply unscrew. Chimney caps often do very little to keep bees from moving in, unless they have a pull string to close the chimney when not in use. These capped chimneys creates a small challenge with removing the honeycomb, that if not accomplished often cause recurring bee problems. Wasps and paper wasps are much less of a problem then hornets. Hornet nests grow fairly large toward autumn or winter season and can block up the chimney flue. hornets are more common in the upper & middle regions of the U.S. as well as Canada. Yellow jackets may also nest in the chimney, though they are much less common. If the chimney is uncapped, removing a hornet nest is typically the best solution. Wasps, yellow jackets, and hornets, are less of a problem with caped chimneys compared with honeybees, as they do not make honey. Honeybees live year round, while wasps, hornets, and yellowjackets abandon the nest early winter, then return nearby the following spring. For help or questions, call our bee hotline and speak with the local beeman near you, and or request a callback. CA: Los Angeles, L.A., San Diego, Orange, Riverside, San Bernardino, San Jose, San Mateo, San Francisco, Oakland, Sacramento. NV: Las Vegas and Reno. AZ: Tucson, Phoenix, Tempe, and Mesa. TX: DFW, Dallas, Fort Worth, San Antonio, Austin, and Houston. FL: Jacksonville, Miami, Orlando, Palm Beach, Tampa bay. Additional areas include: Albuquerque, Atlanta, Baltimore, Boston, Buffalo, Colorado Springs, Charlotte, Chicago, Cincinnati, Cleveland, Columbus, Denver, Detroit, Indianapolis, Jacksonville, Kansas city, Lexington, Long Island, Louisville, Memphis, Milwaukee, Minneapolis, Nashville, New York NYC, New Jersey, New Orleans, Newark, Oklahoma City, Omaha, Philadelphia, Phoenix, Pittsburgh, Portland, Raleigh, Rhode Island, Seattle, St. Louis, Tacoma, Trenton, Virginia Beach, and Washington DC. We just noticed this week honeybees (a dozen at a time) entering at a loose brick in a capped and closed off chimney. Have tried spray to discourage them but 3 days now and seems no difference. We cannot dismantle this chimney to gain access. Any ideas? Beekeeper: Hi Gary, It sounds like you have an established hive, and it most likely requires the help of a professional. We should be able to give you a couple of options to take care of the problem. Our guy in Denver can swing by and check it out, just visit our Denver Colorado bee removal page and give the number a call. I had a swarm of bees about a foot wide and two feet high on the back chimney wall. They dispersed but have made a home in the outside chimney wall by going through a four inch by four inch vent near the bottom of the chimney. Not sure but I think that little vent goes into the cavity between the firebox and outside wall. Should I spray bug spray near the vent or close it off? I am confused as to what to do next? Beekeeper: Scott, How long have the bees been there? It sounds like you'll probably have to open it up and get the hive and honeycomb removed. Usually a home will only get a hive once in several decades. Otherwise, if it is just a day or two old and you actually saw them swarm in, then you should be able to have them eradicated or extracted, then bee-proof the vent that leads into the chimney space and call it good.